The Grado family has deep roots in Brooklyn, where they have been hand building headphones and cartridges since 1953. Tradition and heritage have been carried down through three generations. Joseph Grado, a watchmaker at Tiffany, begins making phono cartridges by hand at home in Brooklyn. 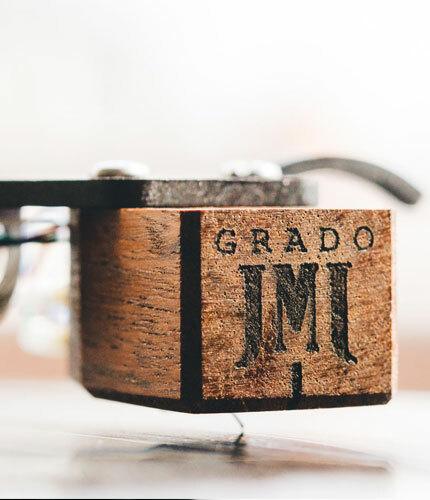 After Joseph Grado's hand-built cartridge production exceeds the limits of his kitchen table, he closes Grado Fruit around the corner from him and Grado Laboratories is founded. With word-of-mouth stronger than expected, Grado decides to forgo paid advertising and put more focus on their end product. Grado has still not paid for advertisements or endorsements to this day. 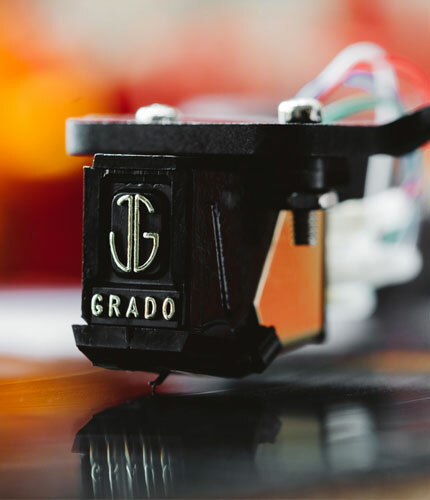 Grado starts to exclusively build phono cartridges. John Grado's first day at Grado at the age of 12 sweeping the floors. Joseph takes his nephew John under his wing to teach him about everything from sound to electrical engineering. The cartridge is still king as Grado Labs rides the heyday of vinyl records. The Grado Signature Series is created to discover what is possible with working with metal. John Grado graduates and joins Grado full time. John starts running day-to-day operations. The phono cartridge business continues to grow. Cartridge production hits its highest peak with each being hand-built in Brooklyn. With global turntable sales slowing due to more portable options becoming prevalent, Joseph plans on retiring. John decides to buy the whole company from his uncle, becoming President and CEO. Joseph retires. John builds the first Grado headphone. John, Loretta (his wife), and one more employee are all that make up the 3 person company. Jonathan Grado is born. The first Grado built from metal is released in the SR325. The new SR60 has a review that puts it on the map. John & Loretta continue to build each pair as Grado starts once again growing. Sisters Lorina & Isela are hired; they continue to oversee headphone production today. 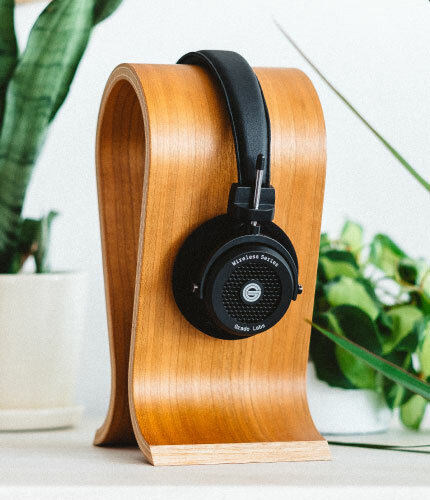 One night, John wakes up with the thought to build headphones out of wood. He goes downstairs to carve & build the first wooden Grado, the RS1. A line of wooden speakers using a unique driver formation is designed and completed by John Grado. With the SR60s sudden popularity at the same time though, all focus is kept on the headphone line. The speakers remain at Grado unreleased to the public. The first wooden cartridges are built, the Reference Series. The first Grado headphone amp is built from a single block of wood. Forbes profiles John Grado, calling him "one of the world’s finest names in stereo headphones." The now iconic Grado Listening Room is built, where the sound for all future Grados would be designed. The Brooklyn company celebrates their 50 year anniversary with the release of a limited edition gold SR325. Grado releases its 2nd generation line of headphones, The i Series. Jonathan starts building Grado's first social presence while in college. Grado’s first line of in-ears are released. Jonathan's first official day at Grado. Grado releases the 3rd generation of headphones, The e Series. Grado is named in the Top Eight Most Social Small Companies in America by Mashable. WIRED calls Grado “Best Headphones in the World”. Grado becomes JetBlue's official headphone. Instagram profiles Jonathan Grado and how he "Helps Shape the World of Grado Headphones”. Grado builds the first headphone ever to be out of Brooklyn tree, the GH1. American Express has Jonathan in a surprise commercial. Metal meets maple in the new flagship PS2000e. Matthew’s first official day at Grado.John Grado is given a lifetime achievement award. Grado Labs was founded by Joseph Grado (1924-2015) in 1953 in Brooklyn. Over the past 61 years, Grado has become famous for their remarkable headphone and phono cartridge designs. Joseph Grado is responsible for more innovations in phono cartridge design than any other person in our lifetime, inventing the stereo moving coil phono cartridge and holding more than 48 patents. Joseph Grado is responsible for more innovations in phono cartridge design than any other person in our lifetime. He was inducted into the Audio Hall of Fame in 1982. Born in New York, Joseph Grado left vocational high school at age 16, where he had been studying watch-making and had been at the top of his class. He went to work for Tiffany & Company and also taught the craft of watch-making in the evenings. When he discovered hi-fi sound in the early fifties, he visited Saul Marantz to get help in improving the sound of his audio system. Impressed by Joseph's gifted ear, Marantz sent him over to Sherman Fairchild's floundering hi-fi division. With Saul Marantz making the introductions, Joseph promptly landed a top position in the company. As soon as he came up with a design for a viable product, he went out on his own. Scraping together $2,000, Joseph began to produce phono cartridges. In 1953 he started production of his cartridges on the kitchen table, Grado Labs’ first home. In 1955 Joseph opened a factory in Brooklyn on the site of his Sicilian born father's grocery business which, to this day, has been the home of Grado Laboratories. In the early years Grado also produced speakers, turntables and the highly acclaimed wooden tone-arm, which came in several models. In 1963 all of Grado's resources were dedicated to creating the world's finest phono cartridges. Grado Labs ceased production of all other products and, for the next 21 years, focused only on cartridges. In 1976 phono cartridge design was taken to the next level and the first true high-end cartridges were created under the tutelage of Joseph Grado Signature Products. These new cartridges were very highly regarded and were the first to reach a price tag of $1,000. In 1984 Grado introduced the Joseph Grado Signature Tone-arm that was so well received that, even now, years after the last one was shipped, calls are still received inquiring whether any are available for sale. In the late 1980s Joseph began the development of what was to become the first true high-end dynamic headphone. The introduction of the Joseph Grado Signature Series of headphones was a major event in the evolution of headphone design. Joseph's painstaking design process, combined with nearly a half century of experience manufacturing precision audio devices, astonished even the most critical reviewers. Joseph extended headphone performance to levels previously attained by only the very best full-range speaker systems in areas of dynamics, pitch control, harmonic accuracy and bass quality. In the process, he once again created a new category - true audiophile quality headphones. Now deceased, Joseph was inducted into the Audio Hall Of Fame in 1982. Taking the reins and becoming President & C.E.O. in 1990, John Grado, Joseph’s nephew, created and released Grado’s first line of headphones that the Brooklyn company is known for today. From Grado’s first headphone entry to 2014, John has created over 60 headphones. This Prestige Series of headphones went on to win more awards than any other headphone line in the world. He had come a long way from sweeping the floors of Grado in the ‘60s. In the beginning, John lived with his family on the top floor of the factory. His wife, Loretta, and he would build the headphone order themselves on a small worker’s bench everyday for the first few years. Around the same time of the introduction of the headphones, he built the Grado Towers: a twin set of six foot tall stack of 32 RS1 drivers (64 total) encompassed in a wooden body. 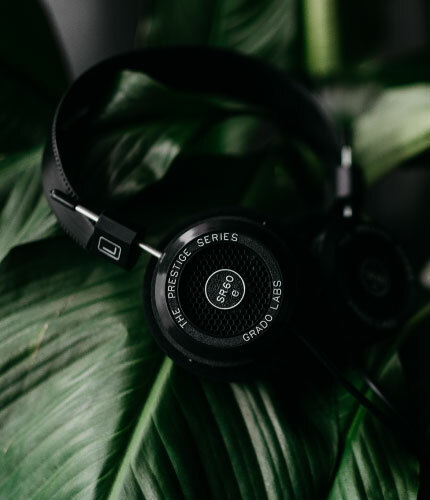 Due to the immediate popularity of the headphones though, the Grado Towers remain unreleased to this day as there was no need to enter both the speaker and headphone space. The Towers are currently in Grado’s Listening Room, which WIRED calls, “the Magical Room Where the Best Headphones in the World Are Made”. With a new focus on headphones, John didn’t forget about Grado’s roots. He set out to redesign the entire Grado line of phono cartridges. John took the knowledge gained while designing the wooden Reference headphones and applied this in the cartridge designs. Grado’s system of damping has virtually eliminated resonant distortions in the magnetic and electrical circuits in the cartridge, bringing analog to a new level of performance. 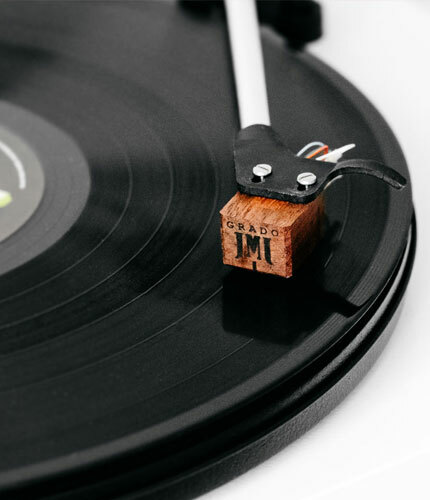 The wooden Reference and Statement Series of phono cartridges have been praised by analog aficionados as "the most significant advancement involving analog reproduction in the last thirty years", and honored with a Golden Note Award for analog design. Grado also revised the entry level cartridges with the Prestige Series which has been touted as the "Best Value" in phono cartridges in the world. John has brought Grado’s headphone lines from one generation to the next, introducing every headphone that is available to this day. In 2008 he created The i Series, the second generation of Grado. For the first time, he also decided to enter the in-ear headphone market at the urging of his sons, Jonathan and Matthew. In 2011 the in-ears came to fruition. The boys realized the importance of this booming segment of the headphone market and that the third generation of Grado would be a part of it. Jonathan and Matthew were both instrumental in the process of voicing of the iGi, GR8 and the GR10. Jonathan Grado is now Vice President of Marketing for Grado Labs, “I grew up on the top floor of Grado Labs,” says Jonathan, “so now I’m working with people who have known me all my life". Even though he’s John’s eldest son, Jonathan never felt pressured to join the family company. 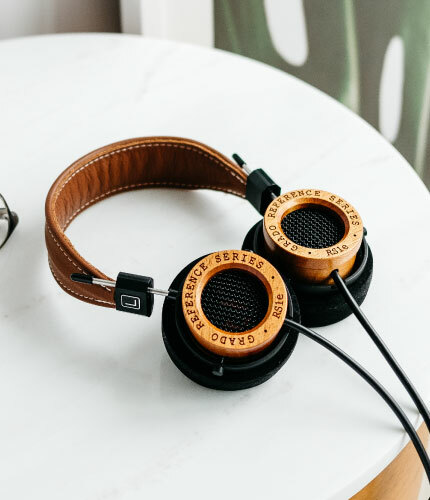 It was only in his sophomore year of college that he found a passion talking to Grado users, leading him to craft Grado’s social efforts and expand the company’s narrative. Jonathan was in charge of the launch of The e Series, the third generation of headphones, in mid 2014. Although the new headphones look suspiciously similar to the older models, everything about them is improved. From the housings to the wiring, to the cones and coils, The e Series represents Grado’s third generation of audio excellence. With being named in the Top 8 Most Social Small Businesses in America, Grado has shown it can adapt while keeping their traditions deep rooted in family, quality, and Brooklyn.